It's my favorite sale week of the year! BOGO berries are here. Strawberries, blueberries, blackberries and raspberries. I usually end up with 8 containers of berries. Two of each variety. Then the only trouble is deciding what to do with all the fresh treats. This year I have a plan! 1. Strawberry Scones. I saw the recipe online, and thought it looked wonderful. I'll have to race the kids to the berries because they like to just eat them whole. Now, if you're short on time, you can pick up a mix kit in the baking aisle, and just add the fresh berries of choice. 2. Blueberry and broccoli salad. It sounds a bit weird, but I love the idea of putting a bit more broccoli into our diets and sweetening with a bit of blueberry. If you're looking for savings on the pasta portion of this recipe: Save with Barilla coupons. 3. Raspberry Brownie Parfait. This is a recipe only, and frankly, you can skip the whole adventure and just pick up chocolate brownies, some Cool Whip (coupon on link or use your digital offer on your CM app) and you're ready to enjoy! It's simple and easy and....includes chocolate. 4. Blackberry Crumble. My daughter's absolute favorite treat! You can't go wrong with this one, and it's even baked in a cast iron skillet. It's wonderful with vanilla bean ice cream, so use your Praire Farms coupons to pick up a quart while you're shopping. 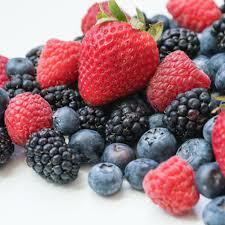 Please feel free to share your favorite Berry plans on our Facebook page this week!